Globalization and the recent developments and spread of technology call for an adaptation of value creation strategies. As the potential for rationalization and achieving flexibility within companies is to the greatest possible extent exhausted, approaches to the corporate reorganization of value creation are becoming increasingly important. In this process, the spread and further development of information and communication technology often provide the basis for a reorganization of cross-company value nets and lead to a redistribution of roles and tasks between the actors involved in value creation. While cooperative, decentralized and self-organizing value creation processes are in fact being promoted, the associated potential for development and production engineering is being underestimated and hence not implemented sufficiently. This contribution will first describe the emerging transformation in value creation taxonomy and then, on the basis of a case study, develop an adequate framework for value creation configuration. 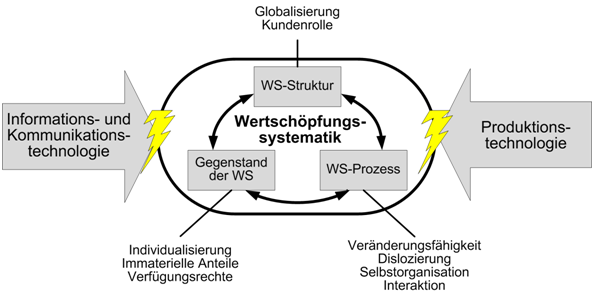 aus: Redlich, T., Wulfsberg, J.P., Bruhns, F. : Open Production – wissenschaftliche Fundierung der Wertschöpfungsgestaltung in der Bottom-up-Ökonomie.